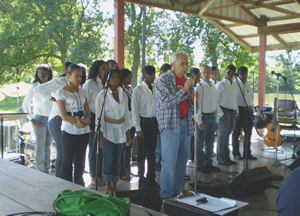 The youth of New Vision World Ministries prepare to share with those gathered at the Cahokia Connections 2010 celebration. Nearly 300 attended the event representing some 50 area churches. CAHOKIA – Some 300 people turned out Sept. 24-25 as part of Cahokia Connections 2010 – a joint celebration of the area churches in and around Cahokia. The event gave participants the opportunity to worship God together, to fellowship with one another, to play in the park and to experience the beautiful early fall day God gave to us on Saturday. In all, 50 churches were represented in this community witness that the church of Jesus Christ is one and is here to serve, to love and to make a positive difference for all who live in this city. About 70 people gathered to hear the Rev. Sylvester Weatherall, pastor of Springfield Grace and Kumler UMC’s, as he spoke three times throughout the weekend. Weatherall challenged the group and spoke of the history-making event in which the congregations were participating. Volunteers from churches in the Cahokia Church Alliance volunteered their time in hospitality, prayer, cooking and serving food and doing cleanup. Cahokia businesses, the school district and village also lent their support to the event. Bill Mokriakow of Maplewood Park Baptist Church organized musicians, including himself and his brother, to lead us in worship throughout the weekend. Musicians included the Cahokia High School Choirs, youth band C.I.A.A.D., Darius Williams, a.k.a. Christmatic, Alberdia Holman and the Praise Team all from New Visions World Ministries, Lonzell Haire of New Psalmist C.O.G.I.C., Kevin Wiggins of Mt. Nebo Missionary Baptist Church and Myra Gummershiemer of Immanuel U.C.C. Pastor James Cook of Carondelet Christian Center served as emcee for the weekend. Crystal Schaefer of Prospect UMC shared her testimony of God’s transforming love. Following her testimony, Paul Kurrelmeyer invited everyone to participate in Life’s Healing Choices being offered at Cahokia Park UMC which began on Monday, Oct. 4. Churches have already begun planning for next year’s celebration and working on ways in which to cooperate and coordinate ministry. For information about the Cahokia Churches Alliance contact Rev. Beth McLaughlin at Cahokia Park UMC at 618-332-0909, or Pastor Barry Simmons at New Visions World Ministries at 618-337-4444.